This journal shares fruitful reflections on life and career prompted by the author's visit to her personal place of retreat near her country home. To ask other readers questions about A Circle of Quiet, please sign up. Can I download this book to kindle or iPad? Open Road Media They have yet to be published as ebooks...but we're fixing that this fall! Look for all the Crosswick Journals on ebook in late November. I’d be surprised if the majority of readers have not read “A Wrinkle in Time.” It is undoubtedly her most loved book, although the road to a publisher was a rather long journey. Nevertheless, she did, and the rest is her story, part of which is contained in this part memoir / journal, part love story, part spiritual journey, and also in part advice for writers, her teachings and observations as Writer-in-Residence. Reflections on her family, both the one she was born into, and the one she and her husband Hugh Franklin (an actor with many credits, both theatre and television, but possibly best known for his role as Dr. Charles Tyler on “All My Children”) created, her feelings about moving from NYC to Crosswicks, life in a small town, and her love of nature. This covers a lot of bases, and a significant amount of a lifetime, but it never feels as though she’s doing more than just having a conversation with a friend. A string of chats on the front porch. Originally written in 1972, this will be available for the first time for e-readers. But don’t let that fool you into thinking that this is outdated, although there are some references that are dated, but …. Some are more applicable these many years later. For me, the topics that grabbed me the most were her descriptions of the surroundings of Crosswicks, their home in a small town surrounded by woods, and reading, although I enjoyed reading all of this. There’s a lightness to her tone in much of her writing that makes this very easy reading, even when the topic might be heavier, but most stories are funny, or inspirational, some delightfully observational. I enjoyed this immensely. This is a perfect use for a reissue...republishing the memoir/journal of a woman who truly thought about her life, her family, her writing, teaching, and her place in the world (and not in any grandiose sense). And there is careful thought here, about not only her family, her writing, her life, but also about the major questions of all life: good and evil, the presence or absence of God, how should children be taught meaningfully, how should one try to live a meaningful life. Within these pages This is a perfect use for a reissue...republishing the memoir/journal of a woman who truly thought about her life, her family, her writing, teaching, and her place in the world (and not in any grandiose sense). And there is careful thought here, about not only her family, her writing, her life, but also about the major questions of all life: good and evil, the presence or absence of God, how should children be taught meaningfully, how should one try to live a meaningful life. Within these pages we meet the well known author of A Wrinkle in Time, who takes us through a young writer's struggles to create...and then to be recognized. We also see how her personal family develops both in New York City and in their beloved out-of-city home at Crosswicks, where they lived when her children were young. We also meet the church choir member who loves singing but isn't so certain about God. We see her at workshops helping teachers of children learn how best to approach them in meaningful and helpful ways. We also see her at the Iowa Writing workshop working with other writers as a guide and teacher. L'Engle lived many existences but appears to have remained her same true self in them all. This was an exciting, at times delightful and inspiring book to read and I believe I will go on to read more episodes of her journal. Any book that so frequently finds me nodding in agreement or amazement at the "rightness" of something said, or highlighting for re-reading or possible quote, has left a mark on me. I very definitely recommend this to those interested not only in memoir but also those interested in writing, teaching and in the art of self-discovery. I picked this up on a whim – for a quarter – from a library book sale, and I’m so glad I did. If, like me, you only knew L’Engle through her Wrinkle in Time children’s series, this journal should come as a revelation. I didn’t know she wrote any nonfiction for adults. The Crosswicks books cannot be called simple memoirs, however; there’s so much more going on. In this journal (published 1972) of a summer spent at their Connecticut farmhouse, L’Engle muses on theology, purpose, children’s educati I picked this up on a whim – for a quarter – from a library book sale, and I’m so glad I did. If, like me, you only knew L’Engle through her Wrinkle in Time children’s series, this journal should come as a revelation. I didn’t know she wrote any nonfiction for adults. The Crosswicks books cannot be called simple memoirs, however; there’s so much more going on. In this journal (published 1972) of a summer spent at their Connecticut farmhouse, L’Engle muses on theology, purpose, children’s education, the writing life, the difference between creating stories for children and adults, neighbors and fitting into a community, and much besides. My copy is studded with Post-it flags. I can see these autobiographical works being especially helpful to aspiring writers. I would compare them to May Sarton’s in subject matter, with the main difference being that L’Engle has more to say about religion and family. One of my favorite parts was a brilliant full-scale example of showing-not-telling. For a while the Franklins lived at Crosswicks full-time and her husband Hugh took a break from acting to run the local general store. She could have just written “we had snooty Jewish neighbors from New York City who never fit in until their house caught fire,” but instead spins a wonderful twenty-page story out of it – and story it is; she admits she has taken liberties with the characters and chronology, but the essence is true. If a writer says he doesn’t care whether he is published or not, I don’t believe him. I care. Undoubtedly I care too much. But we do not write for ourselves alone. I write about what concerns me, and I want to share my concerns. I want what I write to be read. Every rejection slip—and you could paper walls with my rejection slips—was like the rejection of me, myself, and certainly or my amour-propre. I learned all kinds of essential lessons during those years of rejection, and I’m glad to have had them, but I wouldn’t want to have to go through them again. Of course. It’s all been said better before. If I thought I had to say it better than anybody else, I’d never start. Better or worse is immaterial. The thing is that it has to be said, by me, ontologically. We each have to say it, to say it our own way. Not of our own will, but as it comes out through us. Good or bad, great or little: that isn’t what human creation is about. It is that we have to try; to put it down in pigment, or words, or musical notations, or we die. Timing is everything. I was ready for this one at this time. Nothing fancy, just a long summer’s afternoon discussion with a friend. I just listened. While this book could be considered dated, I found it strangely prescient and relevant. I've grown up reading Madeline L'Engle's writing. I don't remember exactly when I first read A Wrinkle in Time, but I think it's safe to say I was in elementry school, both exhilarated by life and by learning, and uncertain of where I fit into anything, especially with my peers. I'm just now realizing that for most of my life until the past few years, I've felt like my existence in this world was somewhat of a mistake. I've turned to Wrinkle and the other books in the Time Quartet over the years I've grown up reading Madeline L'Engle's writing. I don't remember exactly when I first read A Wrinkle in Time, but I think it's safe to say I was in elementry school, both exhilarated by life and by learning, and uncertain of where I fit into anything, especially with my peers. I'm just now realizing that for most of my life until the past few years, I've felt like my existence in this world was somewhat of a mistake. I've turned to Wrinkle and the other books in the Time Quartet over the years whenever I feel frustrated, restless, lonely, ugly, or even just bored. These stories alway help me feel braver and stronger - that my existence here is definitely not a mistake, that there is something bigger than me, that I have a purpose and a place in the universe. I started A Circle of Quiet today on my lunch break, and I'm about halfway through after a few hours of reading tonight. Even in her non-fiction, L'Engle inspires me and helps me reach my center. She raises questions about subjects that have been heavy on my mind recently - love, faith, art, responsibility, creativity - and yet I never feel inadequate for not having good answers to any of my questions, or to hers. She reminds me to have faith in the world around me and in life. That's what this book gave me. Not the kind that comes from seeing someone else's life and contrasting it to your own, but instead the sort that comes from deep introspection. Five stars. Totally a five star read. I read this after visiting a great friend who gave me a copy, and fell in love. I loved that she is a writer and a "normal" person at the same time. The unashamed honest humanity of it. And the beautiful musings on being, and being happy. The passion for ontology. Good for anyone trying to feel peaceful or normal or just wanting to share in someone else's life for a while. Madeleine L’Engle, beloved author of such Newbery winners as A Wrinkle in Time and A Ring of Endless Light, begins her series of four memoirs with A Circle of Quiet. About : Wife-mother-writer. This is how Madeleine refers to herself, and it’s just one of many things that make this book feel so relevant. I can hardly believe A Circle of Quiet was published almost half a century ago; and I am so glad Open Road Integrated Media is republishing it as an ebook. L’Engle is an irresistible study in c Madeleine L’Engle, beloved author of such Newbery winners as A Wrinkle in Time and A Ring of Endless Light, begins her series of four memoirs with A Circle of Quiet. L’Engle is an irresistible study in contradictions: episcopal and agnostic. An American born, European bred New Yorker who loved her country home in rural Connecticut. A writer, theoretical physicist and theologian (unofficially, those last two). An apolitical, but concerned environmentalist. A successful author married to a successful actor. It is she who first encouraged me (through her books; I wish I could have met her! She died in 2007) to seek harmony between modern science and my own faith (although my thoughts on the subject fall more in the realm of C.S. Lewis's conclusions, in The Abolition of Man, than in hers). I knew the time had come. I picked it up and drifted away, happily bemused, in the current L’Engle’s quietly explosive ruminations. A Circle of Quiet breezes through the decade Madeleine spent at her rural “commune” of Crosswicks, raising her children and writing books that publishers refused to buy. I say the book “breezes” through this period because I felt light, reading much of it, as I already have wrestled with many of her concepts in her other works; but for readers new to her bewildering assortment of convictions, the experience of reading a L’Engle memoir may be less of a breeze and more of a gale. A Circle of Quiet examines creativity, cosmology, science, God—all the big questions. But Madeleine is especially taken with the concept of ontology, in this volume. The study of existence and being. She sides with rebellious teenagers on most things, at least in her heart, which might be why her books have always been so appealing to young people. Her ideas about ontology did give me a calming peace, as a teenager. Take a look at the stars and breathe. It's okay. That kind of thing. She also talks a lot about how mythological truth is different from provable fact. Whenever she wrote (fiction, memoir and everything else), she drew directly from her own experience, perhaps more so than most writers I’ve read before; but she doesn’t stick close to the facts. She tells a story to make her point. While a long, important story in her memoir perfectly communicates her feelings about a certain city couple (the Brechsteins) who have moved into her rural community, she openly acknowledges that the exact facts—their names, the locations, the words spoken in their encounters—are not exact. "Thinking about the Brechsteins, attempting the not-quite possible task of separating fact from fiction in this sketch, teaches me something about the nature of reality. On one level, one might say that the Brechsteins are not real. But they are. It is through the Brechsteins, through the world of the imagination which takes us beyond the restrictions of provable fact, that we touch the hem of truth." The truth, not the facts, are what concern her. Creative writing is not journalism, she harps. So I became choir director." Overall : While the memoir can occasionally feel childish in its emotional coloring, it is more often delightfully childlike—a distinction she herself makes—in its wonder and joy for life itself. She's a sharp observer, even if her observations may, at times, be suspect. I really enjoyed A Circle of Quiet for the illumination of her life, convictions and writing habits. And I already have a copy of book II! Yay! Gorgeous, insightful, fascinating. Mothers and writers and thinkers should all read this first installment of the Crosswicks Journals. I saw that my friend Anne White read and recommended this book, and when I saw it at the last book store sale, 6 months ago or so, for $1.00, I was excited. This book and Flannery O'Connor's Complete Short Stories were the major hits that sale. Which reminds me that I truly have many exceptional great titles I need to read. This reminds me of a title that has mixed reviews among my friends and acquaintances, Howards End Is on the Landing: A Year of Reading from Home. I read from my shelves, but I keep buying books. My book spending is not problematic or out of control. If it were, I'd stop or slow it down to a reasonable pace. And I often go through my books, and pick those I'm not interested in anymore for some reason, and turn them in at that same local bookstore for credit. I truly pay very little for the books that interest me, I'm privileged to find them at very good prices. I also use the library for audios or Kindle books. Enough. Back to the book. It's difficult to review it since it's thoughts and anecdotes. This is just a short and informal record of my impressions. I liked the book, its confidential tone. It was like sitting down for a coffee with Madeleine every time I opened it. In it, she shares as much as she can share about her home life, her relationship with her husband, -a theater actor-, with her children, friends, and community. Crosswicks, the name of this series of three books from which A Circle of Quiet is the first title, is the name of the place in NJ where she had a summer home. What I appreciated the most in this book were her thoughts about art, writing, youth. How she speaks about science versus myth, how myth and fantasy relate to faith, and the mysterious. I found this two year old article of an English teacher who speaks of what L'Engle and C.S. Lewis meant to her. She talks about the whole Crosswicks series. One of them is devoted to her courting, marriage, and life with her husband, the actor Hugh Franklin. The article gave me a good insight of something I felt while reading this book and others similar to it, (such as The Life Giving Home, by the Clarksons), the problem with books that tell about our lives. I like Jeanette Walls's approach to this issue in her novel The Great Castle. When I read it, knowing that it was based on her own life, I had to forget about that. It's hyperbolic in some places, it wouldn't work if we keep comparing it to reality. I agree then, that it's easier to 'write about ourselves through fiction'. Sometimes, as the article remarks, we find the fictionalized characters of an author to be very real, while the real people portrayed in the books appears fictional. I've noticed that when talking to others about my past, or my family in Madrid, etc. During our vacation, my parents, siblings and I had a very intense talk. We all related how their parenting felt for each of us. While we have some common experiences, and there's a degree of objectivity in any situation, but a book or memoir it's not a compilation of facts, neither does fall one hundred percent into fiction. Probably, L'Engle did what I do when I talk to others about my extended family, I do focus on the positive, I place problems or bad experiences into a wider context, I find meaning. What I appreciate about books like this, it's that the ideas, concepts, the world views the author presents, are nicely tangled up with personal anecdotes into a peculiar life narrative. Frankly, I'm not the one to check what's mentioned in the book against facts or second opinions. But I warn you, many times the children of the author, or those around, don't see the match between how a relative, or some events are told by the author, and the reality they lived. All of the sudden, instead of more typically reviewing A Circle of Quiet, I'm just disparaging about many books and a mix of ideas. But this is what good books provoke. They exhort you to make connections, to see themes that cut through many authors, (what does a writer do, how do we live, what's real, what's missing in our life), themes that occupy the mind of a reader. I loved this book so much, I read it in small pieces so I could savor it. A Circle of Quiet is one of my favorite books of the year, maybe even of my lifetime. Ms. L'Engle's voice speaks so assuredly, winding bits and thoughts that seem somehow unrelated into a profound yet simple point over and over again. I especially love her shared experiences about her writing career, her family life, her quiet solitude, and her faith. A beautiful, much-treasured book. A Circle of Quiet is a rambling quasi-memoir on various aspects of life in general, but with a significant amount of musings on writing and artistic life. The latter was the element that I enjoyed the most. The broader philosophies that L'Engle wades into I didn't find quite as satisfying, probably because the brand of "faith" that she describes doesn't seem solid enough to base a clear worldview on. L'Engle identifies as both Anglican and agnostic, but while she affirms belief in a loving God a A Circle of Quiet is a rambling quasi-memoir on various aspects of life in general, but with a significant amount of musings on writing and artistic life. The latter was the element that I enjoyed the most. The broader philosophies that L'Engle wades into I didn't find quite as satisfying, probably because the brand of "faith" that she describes doesn't seem solid enough to base a clear worldview on. L'Engle identifies as both Anglican and agnostic, but while she affirms belief in a loving God as creator of the world, I didn't get any sense of true orthodox Christian theology in her beliefs. While she makes often perceptive, pithy observations about life, culture and relationships, as well as a few clear-eyed comments about the failings of the modern Christian church, in the philosophical sense I always felt there was a bit of a missing piece somewhere. I think that all artists, regardless of degree of talent, are a painful, paradoxical combination of certainty and uncertainty, of arrogance and humility, constantly in need of reassurance, and yet with a stubborn streak of faith in their validity, no matter what. ...I am often, in my writing, great leaps ahead of where I am in my thinking, and my thinking has to work its way slowly up to what the "superconscious" has already shown me in a story or poem. Facing this does help to eradicate do-it-yourself hubris from an artist's attitude towards his painting or music or writing. My characters pull me, push me, take me further than I want to go, fling open doors to rooms I don't want to enter, throw me out into interstellar space, and all this long before my mind is ready for it. ...A great painting, or symphony, or play, doesn't diminish us, but enlarges us, and we, too, want to make our own cry of affirmation to the power of creation behind the universe. This surge of creativity has nothing to do with competition, or degree of talent. When I hear a superb pianist, I can't wait to get to my own piano, and I play about as well now as I did when I was ten. A great novel, rather than discouraging me, simply makes me want to write. This response on the part of any artist is the need to make incarnate the new awareness we have been granted through the genius of someone else. The kind of book that I will never consider fully read, as it will be constantly re-read. A book to dip into and quote when things get tough. A book to inspire and guide, whether you agree or disagree with all that she says. A book all women writers, especially mothers, need to read. Nonetheless, it is a lovely, sweet read, about parenthood and marriage and communities both large and small. About our responsibilities to those who came before and to those who come after. About the repeated rejections of Wrinkle before it was finally published -- and won the Newberry. About aging and about staying in touch with the child one was. Another memoir for the year. Based at least partially on her journals and the writing of A Wrinkle in Time, L'Engle writes about her own journey to faith, ontology, time, love, writing, and joy. She writes with such beauty and honesty about her life during this period: her life as a person and what that means. I can't wait to read Summer of the Great-Grandmother. I loved this book so much! And reading this reminds me of how much I love Madeleine L'Engle and how much I want to read (and re-read) everything she wrote! I shouldn't really be surprised given how much I love L'Engle's Wrinkle in Time books. And this book gives us her thoughts on everything from theology, writing, children’s education, writing books for children vs. adults, and more. There is also encouragement here for those who want to see their own books published: A Wrinkle in Time was rejected 26 times before it was published! I've loved reading for as long as I remember. However, I do remember two books that my second grade teacher read aloud to our class that would affect the genre I would love for the rest of my life: (until present day anyway!) The Lion, the Witch, and the Wardrobe and A Wrinkle in Time. So when I saw this book written by the author of A Wrinkle in Time, I was eager to read it and learn more about her. Crosswicks is the name of her New England farmhouse. As she writes this "letter" she describes it I've loved reading for as long as I remember. However, I do remember two books that my second grade teacher read aloud to our class that would affect the genre I would love for the rest of my life: (until present day anyway!) The Lion, the Witch, and the Wardrobe and A Wrinkle in Time. Crosswicks is the name of her New England farmhouse. As she writes this "letter" she describes it, she has just celebrated her fiftieth birthday, and during the summers four generations stay in her old house. Every so often I need OUT;...-away from all these people I love most in the world-in order to regain a sense of proportion. My special place is a small brook in a green glade, a circle of quiet from which there is no visible sign of human beings. From this circle of quiet, she writes about many different things. She talks about religion and Christianity. She talks about what she finds the meaning of her life to be. Of course she talks about creativity, writing, art,and teaching throughout the book and she often uses other famous authors in her observations. My favorite part is when she discusses how she is still joyful despite being unhappy or in pain. She discusses so many different things. Some of her observations are more meaningful to me than other issues. But for those points alone, and for whatever things will be meaningful to you, this short book is worth a read. This is the second work of nonfiction that I've read by L'Engle, and her nonfiction confirms her as one of my favorite authors. I love her style, her sense of humor, and the way in which she expresses her beliefs, simply yet profoundly and beautifully. I read this book aloud with my dad, and we both loved it. We got into some good discussions about life, society, and God while reading it together. It's the first book that I've read completely with him. Usually, I just read to him whatever I happe This is the second work of nonfiction that I've read by L'Engle, and her nonfiction confirms her as one of my favorite authors. I love her style, her sense of humor, and the way in which she expresses her beliefs, simply yet profoundly and beautifully. I read this book aloud with my dad, and we both loved it. We got into some good discussions about life, society, and God while reading it together. It's the first book that I've read completely with him. Usually, I just read to him whatever I happen to be reading, and there have been books that I've read mostly with him, but this is the first that we've read together from start to finish. It's nice to read aloud because of the beauty of L'Engle's writing. I admire L'Engle. Not only was she an amazing author, but she was also unafraid to put herself out there, to express her doubts along with her faith. I want to be an author of her type, to make an impact and to write well at the same time, to tell a good story, but more importantly, to give my readers something and someone to relate to. Although I've heard of L'Engle, I don't recall ever reading any of her books, even the more famous Wrinkle in Time. I got this book on a whim and now it's one I won't part with. Circle is book one of the Crosswicks Journals. I had, wrongly, assumed this was fiction but found that this series of books are pulled from L'Engle's personal journals. Judging from the journals alone, what a fascinating, intelligent, and insightful woman! I ended up writing in this book quite a bit and have already went Although I've heard of L'Engle, I don't recall ever reading any of her books, even the more famous Wrinkle in Time. I got this book on a whim and now it's one I won't part with. While she has been deemed a children's author, she takes a more practical approach and claims she's just a writer. If she feels a subject is too harsh or complicated, she will make it a children's book because children are more open and not yet close-minded to ideas. One of her main topics is how to help children be children and how to not keep trying to "save" them from the world. Very interesting ideas are put forth that make a lot of sense. Looking forward to reading the other journals in the series. This book is about teaching children, writing, family and community, the modern world, love, religion and some other things. I don't agree with L'Engle on lots of things, but I agree with her on lots of other things, and I came away from the book feeling refreshed, revived. The Prophet by Kahlil Gibran -- this This book is about teaching children, writing, family and community, the modern world, love, religion and some other things. I don't agree with L'Engle on lots of things, but I agree with her on lots of other things, and I came away from the book feeling refreshed, revived. I just read this book again and it is still at the top of my list of favorite books. I needed this little jolt to jump start my reading again. I have not been reading as much lately and needed something to change that and this book did that for me. I guess I just needed a refill of greatness to fill my tank and get me back on the right track. I really wish I knew something flowery and wonderful to say about this book. I cannot. All I can say is Maldeleine L'Enlgle just has a way of touching my he I just read this book again and it is still at the top of my list of favorite books. I needed this little jolt to jump start my reading again. I have not been reading as much lately and needed something to change that and this book did that for me. I guess I just needed a refill of greatness to fill my tank and get me back on the right track. L'Engle speculates on life and love and the nature of the universe, not to mention writing. Oh, the writing! It's fascinating to hear from a Newbery-winning author, someone whose work I've loved and whom I've looked up to since I was a child, and realize how similar we are in our quirks and fears and insecurities. But what a hilarious, beautiful, intelligent woman she was! I'm anxious to get the rest of the Crosswicks journals, and I'm severely put out that her non-Time Quartet children Wonderful. L'Engle is currently one of my favorite authors, and this book pretty much sums her up. A Circle of Quiet is a book about ontology, the study of the world from a bigger perspective in a bigger sphere ( as defined by me, not Webster.) Enough said, I suppose. This book came at the most perfect time for me, and I definitely was deeply impacted by her journal-like writing that takes the reader through L'Engle's mind as she shares her insights and thoughts. L’Engle points to many issues which still are valid today: American anti-intellectualism, the pursuit of pleasure over happiness, the stark divisions between people of different generations and political persuasions, our abuse of the environment, and of course the education and initiation of our children. There are many gems to be found in her book, even for those whose perspectives are secular like mine. Beautifully perceptive. A book to digest slowly and re-read. This book read like the voice of a friend. It's a book I kept picking up simply to spend some time with Madeline, to be encouraged, refreshed. To quiet the creative restlessness in my soul. It reads like a bunch of journal entries, because that is what it is. Otherwise, one would accuse it of being sloppy. It is not meant to be served as a five-course meal, but a rustic weekday supper with the family in a time that feels like it is far behind us. I think I could read a bit of this book every night forever. It’s joyful and hopeful, insightful and encouraging. I really loved reading this. It's just Madeleine L'Engle musing on a bunch of different topics such as parenting, writing, religion, teaching, fiction v. reality, marriage, the difficult time getting A Wrinkle in Time published, etc. I have book darts littered throughout the book because there were so many paragraphs I wanted to take note of. Did I agree with everything she said? No, of course not. But the way she writes and explains things makes any topic she's writing about fascinating. ------- I really loved reading this. It's just Madeleine L'Engle musing on a bunch of different topics such as parenting, writing, religion, teaching, fiction v. reality, marriage, the difficult time getting A Wrinkle in Time published, etc. I have book darts littered throughout the book because there were so many paragraphs I wanted to take note of. Did I agree with everything she said? No, of course not. But the way she writes and explains things makes any topic she's writing about fascinating. "...it's amazing what passing the half-century mark does to free one to be eccentric." "When we are self-conscious, we cannot be wholly aware; we must throw ourselves out first. This throwing ourselves away is the act of creativity. So, when we wholly concentrate, like a child in play, or an artist at work, then we share in the act of creating. We not only escape time, we also escape our self-conscious selves." "So the challenge I face with children is the redemption of adulthood. We must make it evident that maturity is the fulfillment of childhood and adolescence, not a diminishing; that it is an affirmation of life, not a denial; that it is entering fully into our essential selves." "The more limited our language is, the more limited we are; the more limited the literature we give our children, the more limited their capacity to respond, and therefore, in their turn, to create. The more our vocabulary is controlled, the less we will be able to think for ourselves. We do think in words, and the fewer words we know, the more restricted our thoughts. As our vocabulary expands, so does our power to think." 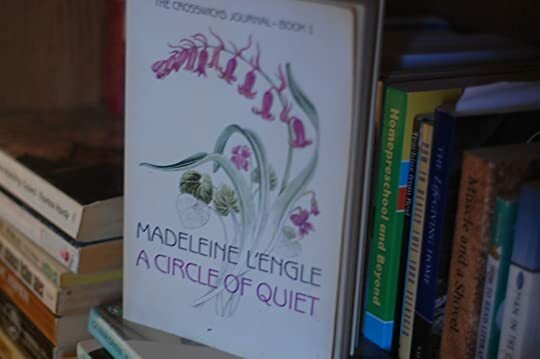 I enjoy Madeleine L’Engle’s books for the most part, but ‘A Circle of Quiet’ left me cold. The author rambled amongst remembrances, often leaving me frustrated, and I was put off by a what seemed to be pretension and an air of self-consciousness throughout the memoir. I gave the memoir 2.5 stars because there were a few nuggets of gold buried in the the author’s maunderings - but, overall, I was disappointed in the book.